A hard hitting biker guy named Angel has sold out his biker gang for money. He has sold the story to magazines and is getting 10 000 dollars in return. Naturally the biker gang is not happy, and they do not take lightly upon Angel’s betrayal. 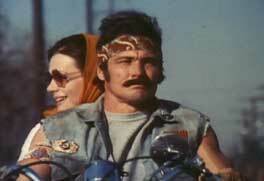 So he has to hit the road on his Harley Davidson and he takes his girlfriend Laurie with him. Together they roam the dust filled streets and dirt roads trying to escape from Angel’s old gang. The biker gang sets out after Angel and on their way the create havoc and destruction. Angel’s goal is to get to San Francisco where he can pick up his money, and then he plans to leave the country with Laurie, but the road to San Francisco is long and hard. After stopping several times to take a rest, he decides to rent an old house in the country to settle down for a while and perhaps make some money. He manages to get a job at a local farmer who needs help around his ranch, and everything seems to work out fine for Angel and Laurie. 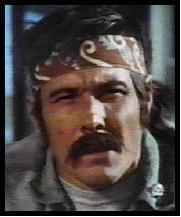 But his old gang is getting closer to his trail, ripping the countryside apart looking for him. How long will it take before they find him…? 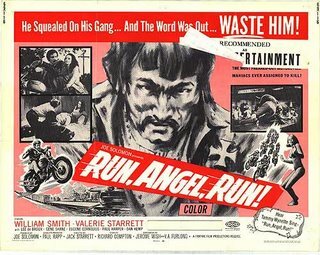 Run, Angel, Run starts of very well and is very exciting and fun to watch, and the film is pure, 70s biker action. Some very cool camera work and pacing makes the entire beginning of the film a rea l pleasure to watch. There is a long sequence where the screen is split up into many smaller pictures and this makes for an even more suspenseful atmosphere as well as a touch of the psychedelic. 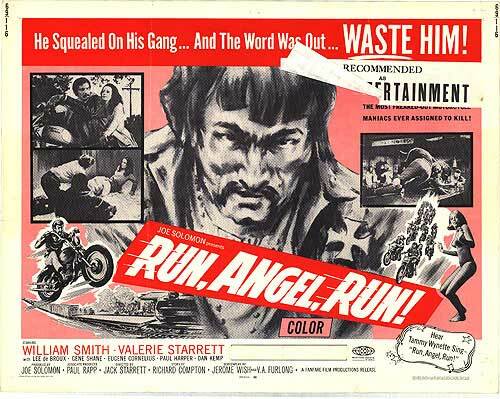 But alas after an hour of hard hitting biker action, the movie takes a sharp turn for the worse as Angel moves into the house with Laurie and starts to work for the local farmer. The film becomes a love story and reminds me more of a cheesy drama flick that’s made for television. This middle part was very though to sit trough as the plotline gets really flat and right out boring. It has its moments again in the very ending, but the middle part sucked the atmosphere right out of the movie. William Smith (Fast Co mpany) who plays Angel does a very good job in portraying the character and he is obviously a very good actor, both in the action scenes and the more romantic scenes. Another positive thing with the film is the soundtrack which helps the film in the more action packed scenes. The guitar driven rock soundtrack is absolutely perfect for a film like this. Overall I can’t really recommend this film… Sure the first 50 minutes or so are extremely cool to watch, but the romantic smudge in the middle really destroys what’s left of the film. Perhaps die hard Bikesploitation fans are able to overlook the middle part… But if you are unfamiliar with this genre this isn’t a good place to start.